Sheriff Rick Staly and County Administrator Craig Coffey during a meeting on the sheriff’s Operations Center earlier in August. The two have not been seeing eye to eye. 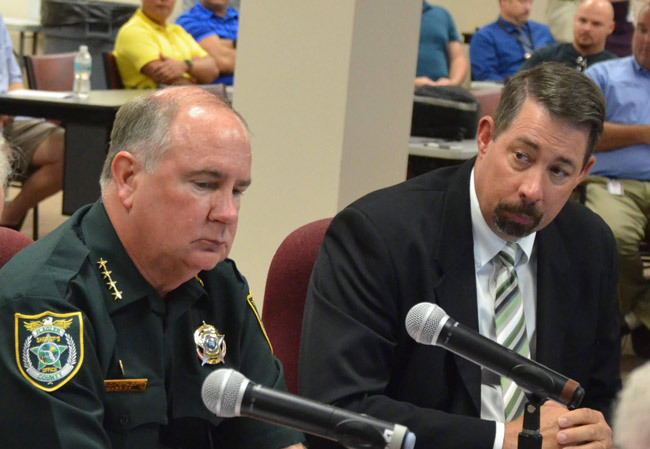 The following remarks by Sheriff Rick Staly, delivered to the Flagler County Commission at a Dec. 3 meeting, are adapted from a combination of his prepared text and the remarks he actually delivered. Staly spoke in the context of a motion, subsequently adopted 4-0 by the commission, to discuss County Administrator Craig Coffey’s fate at a January 14 workshop, after a failed motion earlier in the meeting to fire him. 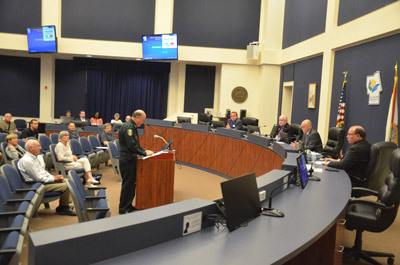 Coffey disputes some of the sheriff’s statements, particularly Staly’s claims regarding the delivery of goods to West Side residents after Hurricane Irma. Coffey said he will respond in due time. He has been extended an open invitation to respond in writing in these pages. I have listened to the discussion and since the county owned Sheriff’s Operations Center and your administrator’s interaction with Constitutional Officers, especially myself, has been a significant part of the discussion I feel compelled to speak. Let me preface my comments that I am not trying to tell you what to do as that is not my place. And as a county Constitutional Officer I would not want you to tell me how to run the Sheriff’s Office or how to protect this community, but I feel compelled to discuss my ability to work with your administrator. First, let me say that I had a good working relationship with your administrator for two years that I served as Undersheriff and my first year as Sheriff. Since then the relationship has deteriorated to where I will no longer meet with him. I will only meet and work with other elected officials and the administrator can work with my appointed designee. This working relationship soured after I discovered that he was trying to undermine my working relationships with this commission, other elected officials, trying to hold me to a different standard than other Constitutional Officers in the way this building crisis has been handled. In fact, I tried to extend an olive branch by setting up a lunch about a month ago and then cancelled it after I learned he was still trying to undermine my relationships with elected officials. In fact, he tried it again just a couple of weeks ago. I will say this, his actions, comments, have destroyed our working relationship and it is not recoverable. Now, I want to give you one other example. It doesn’t include the sheriff’s office directly, or my building. During Hurricane Irma, my deputies were out in the field on the west side. There were people stranded out there because of the high water. They needed water, they needed food. I tried to get it. The comment that I received from the county administrator was, “those people don’t need anything out there because during Matthew they put it on eBay and sold it.” I don’t know if that’s true. But what I told my people to do is go get the water and go get the MRE’s, and deliver it. My people tried to set it up at Hidden Trails, Mahogany Run, when the county administrator found out that there was a delivery truck from the county going there, he cancelled it, and I had to go to the [Emergency Operations Center] and argue and get it sent back to where my people picked it up at [County Road] 305 and 304 I think, and then deliver it at Hidden Trails. That has nothing to do with the Sheriff’s Office. It has to do with what’s right. As to the county-owned Sheriff’s Operations Center no one on this board is responsible for this mess. Neither am I. We have all inherited this problem. But it is our responsibility to lead and find a solution. This month marks the beginning of the 13th month since I started raising concerns and alarms about this building. We have now been out of this building for almost six months in a cobbled together decentralized operation. The judges are not happy, court administration is not happy, the Clerk of the Court is not happy and certainly I am not happy with the current working conditions this situation has forced us all to be in, including my employees. The courthouse, while nice space, is not designed for Sheriff’s operations and has strained relationships and made serving the community more difficult. This building issue is a crisis and it takes crisis leadership to solve it. In the 13-months I have seen virtually no leadership from the administrator on this crisis, unless I pushed it. What I have seen is resistance, denial, legal posturing, inappropriate and demeaning comments about my employees to county staff members and, from what I am told, to other elected officials and administrators in this county and at conferences and delaying tactics. I have asked for almost a year to cut into the drywall and see what’s behind it. For a year it has been denied, delayed, argued against and now we’re hiding behind a false “preservation order.” I say it’s false because the preservation order only applies to me as Sheriff. I’ve been told the county can’t do anything because they are being sued. The real facts are that only the Sheriff’s workers compensation carrier has been sued. The County has not been sued. At least not yet. My legal counsel has advised me the judge does not have jurisdiction over the county because this is a worker’s compensation case so the preservation order only applies to me and I don’t own the building. But at the same time when these stall tactics are being used to not cut into the drywall the county says it’s okay to maintain the building by deep cleaning it, adjusting the HVAC system, replacing pine bark with pretty stones around the building but then hides behind the preservation order as the reason they can’t cut into the drywall. I can sum up all this cosmetic work this way: You can put lipstick on a pig but it’s still a pig. Ironically, if the administrator had cut into the drywall when I first asked for it many, many months ago, it would have been done before there was a preservation order and we would have probably been well on our way to a solution, whatever that may be. The election season is over, the voters have spoken. It’s time to make tough decisions and start finding solutions. As an elected official to other elected officials I look forward to working with you on solving these problems together for the benefit of our community and in my case as Sheriff, for my 308 outstanding employees that protect and serve our community. Rick Staly was elected Flagler County Sheriff in November 2016. Reach him by email here. So our grandstanding Sheriff has hurt feelings eh? I don’t know about the rest of you but I’m getting tired of seeing our County leadership squabbling and bickering like 2 year olds in a sand box. We elected you to do a job. Now GROW UP and do it!! In regards to the Operations Center I’m blaming both the Sheriff and Craig Coffey. Both knew it was a sick building with issues before they even moved employees into it. The Sheriff should have raised as much fuss from the beginning and should have taken steps to safe guard his employees BEFORE they got sick. Now he’s back peddling because of law suits. And what’s up with this unprofessional behavior of I won’t speak to him anymore? Sheriff Staly you’re the head of an agency. You set a role model for leadership. If you haven’t learned by now in Government service you will work with people you don’t like. However you took an OATH to Serve and Protect. And that means you need to get along with everyone. Put those personal feelings aside and DO YOUR JOB!! His attitude of “You collect enemies” is over cocky and self serving. I was not surprised when Commissioner Eriksen ” took a vacation” Coffey has the Commission cowed and no one wants to have to work when someone is doing it for you. We can only hope at the next meeting our esteemed BOCC get’s off their thumbs and sends both Coffey and Sherman packing. Well said Sheriff. Well Said. It is time Mr. Coffey go seek out a new opportunity. .
It’s a shame that Hansen was voted back into office to support Coffey. We need a new county administrator and the commissioners that voted to keep him in should be voted out in the next election. We have a great sheriff doing all humanly possible to keep our communities safe from the drug epidemic and other crimes while respecting our constitutional rights and as such he needs the support and respect as the “constitutional official” (elected by the people) from the Flagler County Board Of County Commissioners aka FCBOCC. Lets do not go back to the unfair witch hunt by the FCBOCC to our past elected constitutional officials like Sheriff Manfre in the past and former SOE, honest Supervisor of Elections Mrs. Kimberle Weeks and also expensive taxpayers funded SLAPP lawsuits against them or residents demanding answers and actions against wrong doing. Why- didnt this guy, just make a small hole behind something on the wall, (or even not) & use a small lighted camera, on a bendable Long Handle- if he was SO worried about it ? Thats is what I would have done. They dont cost a fortune. They both need to go! They worth each other more than people realize. Under Staly we have economic crime blooming in Flagler County. His office is neither investigating nor prosecuting crimes. All they do is just sitting in 2 or 3 cars in the parks or along the roads chatting while Staly does all this great PR speeches. Run them both out of town and stop wasting our money. Staly is just a cowboy. Residents file crime reports and nothing has ever been done by Staly. And when people try to contact him to find out why there is no investigation going on he is avoiding them. Come on Flagler residents, open your eyes, you are cheaply bought here. The sheriff is manipulating us to get a building with his name on it. He has a long history of not getting along with people. The last 2 sheriff’s he worked for, Sheriff Berry and Sheriff Manfre, both attested to Staly’s ability to lie and cheat to get his own way. Staly takes no responsibility for ignoring his own employees for over a year while they complained of illness. Now he is blaming the county manager. Staly even talks bad about the editor of Flagler live behind his back while he uses this website to promote his agenda. The sheriff has raised his own budget year after year and now he demands more. He is the wolf and you are the sheep. What is everybody…5 years old? How about getting back to your jobs? The sheriff is the only one with guts enough to speak out over those WORTHLESS commissioners. Maybe the states attorney should get involved. Coffey should not even be fired but go to prison for stealing and operating an illegal operation to scam Flagler county out of hundreds of thousands dollars. Sheriff Staly has been and is protecting his department rightfully so. Sheriff Staly we respect that your care so much about your officers that protect us and serve us. Sounds to me, Mr. Coffey need to go seek other employment. In any contest involving integrity and effectiveness, Sheriff Staly wins hands down. and we don’t need anymore of those.